A 66 year-old man presents to the ED with hypotension, tachycardia, shortness of breath, and fever. Patient has a history of CAD, DM, DVT, and CHF (EF 20%). Patient reports a 3-day history of malaise, poor appetite, and diarrhea. Physical exam reveals leg swelling. What is your first impression? Septic shock? Cardiogenic shock from underlying CHF? Pulmonary embolism causing obstructive shock? Or hypovolemic shock from decreased intake and diarrhea? With every passing minute of hypotension, organs are at stake. MAP < 65 mmHg is the threshold where impaired organ auto-regulation leads to inadequate blood flow and tissue oxygenation. The primary organs at risk are those that consume a lot of oxygen, namely the brain, heart, and kidneys. Specifically for the heart, hypotension can lead to a vicious cycle of decreased diastolic pressures and coronary perfusion, which leads to further cardiac ischemia, decrease in cardiac output and worsening hypotension. We all know that shock and hypotension are emergencies, but how quickly we act and what we do varies from provider to provider. For many of us, when we think of shock, our minds immediately jump to using vasopressors to augment blood pressure. How quickly can you actually get a vasopressor infusion started? 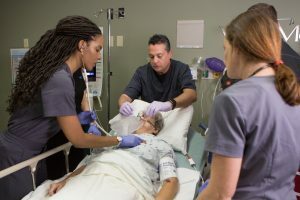 In a study using a database of real-life septic shock patients, the median time-to-initiation of vasopressor was 3 hours after documentation of persistent hypotension, with less than 25% of patients being able to start vasopressor within 1 hour.5 There are many reasons why starting a vasopressor infusion may take some time, including the need for central vascular access, time it takes to write, verify, and dispense the prescription for a vasopressor infusion, and time to set up an IV infusion for administration. As referenced above, at 3 hours the patient is at serious risk of end-organ damage. The hour-1 bundle recently proposed in the updated Surviving Sepsis Campaign guidelines is one example of recognizing the urgency needed to treat hypotensive patients and attempting to institutionalize a more rapid response by giving the explicit instructions to begin IV fluid resuscitation immediately.6 However, the strong response and discussion generated by the proposed new guidelines within organizations such as ACEP and SCCM highlights the differing views and challenges with developing broad guidelines.7 As valuable as this debate is, we cannot lose sight of that fact that hypotension demands immediate attention. Our patients cannot afford for us to be passive: even 1 hour may be too long. So, when the etiology of our patient’s shock is not yet known, what can we do to expedite the restoration of the patient’s hemodynamic stability? Part 2 of this blog will highlight some potential treatment options, with a focus on push-dose vasopressors and rapid fluid boluses. Varpula M, Tallgren M, Saukkonen K, et al. Hemodynamic variables related to outcome in septic shock. Intensive Care Med. 2005;31:1066-1071. Zenati MS, Billiar TR, Townsend RN, et al. 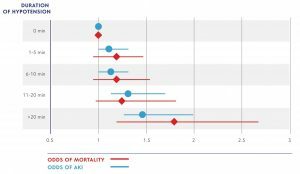 A brief episode of hypotension increases mortality in critically ill trauma patients. J Trauma. 2002;53:232-236; discussion 236-237. Walsh M, Devereaux PJ, Garg AX, et al. Relationship between intraoperative mean arterial pressure and clinical outcomes after noncardiac surgery: toward an empirical definition of hypotension. Anesthesiology. 2013;119:507-515. Marchick MR, Kline JA, Jones AE. The significance of non-sustained hypotension in emergency department patients with sepsis. Intensive Care Med. 2009;35:1261-1264. Beck V, Chateau D, Bryson GL, et al. Timing of vasopressor initiation and mortality in septic shock: a cohort study. Crit Care. 2014;18:R97. Levy MM, Evans LE, Rhodes A. The Surviving Sepsis Campaign Bundle: 2018 Update. Crit Care Med. 2018;46:997-1000. Spiegel R, Farkas JD, Rola P, et al. The 2018 Surviving Sepsis Campaign’s Treatment Bundle: When Guidelines Outpace the Evidence Supporting Their Use. Ann Emerg Med. 2018.